It is normal for people to want to defend themselves when presented with potentially negative feedback, though managers have to find a way to inform employees when they need to change their performance or behavior. Most employees want to improve and though don’t like hearing it, are open to moving forward with the change. What happens when you have an employee, who no matter what you say, defends themselves and either blames someone else or has tons of excuses why he/she couldn’t do better. Emotionally they are not open to hearing helpful input to better their performance. Defensive behavior impacts performance, and they will not get better unless you figure out a way to help them take ownership. So how can you do that? Defensive employees feel they need to protect themselves as they feel vulnerable which could indicate they don’t feel good about themselves. It’s not your role to be a therapist, though if you step back and understand this may be the case, your sensitivity and openness to helping increases and you may feel less frustrated. When you speak with a defensive person, indicate to them you want to discuss areas you feel they excel and areas that need improvement. First, let them know where their value lies in the success of the business and what they do well. Then explain that the company needs everyone to boost their performance. Ask them if they are open to hearing how they can change some areas of their performance and wait for their reply. The goal here is to get their buy-in during the steps. They will probably say “yes” quickly so don’t be deceived that they are genuinely open to hearing you. It’s a start to getting their buy into owning their performance. Choose your discussion about essential areas of performance that will have the meaningful impact when implemented and let go of the smaller issues. For example, if reports are required on a regular basis for management of the company and they are always late, this is an important issue to discuss with the employee. Using the reports as an example, as soon as you start to discuss this, the employee may jump in and come up with various reasons when it’s challenging to complete on time. Start to write down the reasons he/she states and tell the employee you will handle each one separately. After collecting all of the reasons, start one by one and ask the employee “how do you think we can solve this?” The employee may be reluctant to come up with an answer, but your role is to keep asking the same question indicating to the employee that the two of you are here to work together to solve the problem for the employee. If there are legitimate reasons that the employee can’t complete the action, well that’s your job to remedy and tell them you will. Keep in mind that the employee is there to perform and it’s their responsibility to let you know what interferes as well as take responsibility to complete the task. 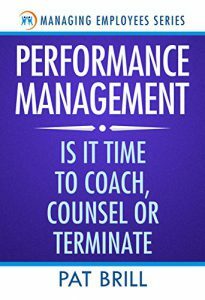 If an employee will not step up to the issue and make the change, and you have put in the effort to coach/counsel them, you may not have the right person for the job. Performance is what a person does; the behavior is how they do it. Employees have different ways of handling work, interactions with others and working with their manager. Employees can have good performance, though their behaviors create tension for you and others on your team. So how do you address it? Is the behavior new or continuous behavior? Always good to step back and see if there are circumstances at the workplace that could be frustrating the employee. Again, let them know that their performance is good and the reasons why. Indicate that what one does is important and how they do it is also essential. Be very specific about the behavior, when it was done and how it impacts others on the team. For example, when they are defensive, they are not open to new ideas, and others feel they are not heard, or you misunderstand others input and feel they are judging you. Indicate when this happen and what was the result of the defensive behavior. Indicate that it’s vital for the team to work together and collaborate to come up with the best solution. The more specific you are regarding how their defensive behavior is impacting the group/business, the better chance you have in seeing a change. Ask “how do you think this can best be handled?” Let them know you and the other team members would be happy to help them in any way. If they are still defensive, then ask them to go back, give it some thought, come up with potential solutions, and then schedule another meeting time. Changing behaviors can be more difficult, depending on the issue, because the employee will have to block their learned reaction. Maybe one potential solution is when they start to defend themselves, they ask for a 5-minute break as that gives them an opportunity to think about their reaction. Any change in behavior has to be owned by the employee. If there are workplace issues or another employee who is difficult for them, then it’s your job to ensure every person on your team is treated with respect and has the tools to do their job. Defensive behaviors can be challenging, though not impossible to manage. A defensive person’s first choice is to defend. Even if the two of you come up with a potential solution to help the employee manage their behavior, this will be an active coaching effort on your part. Whenever an employee makes an attempt to change their behavior, your role is to recognize it immediately. so others can also benefit from your solution.